Bug Wand The Clean Quick and Safe way to be rid of bugs The next time some creepy-crawly is discovered in your home or business, dont spray them, dont whack them, VAC them with the Bug Wand! No more messy splatter on the walls or ceilings. 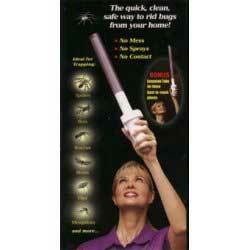 The Bug Wand Vacuum creates a high-powered suction that captures unwanted pests.